Such a simple device. Really helps you develop the feel of hitting a putt with a square face. Just used it for the first time today inside. It's a very interesting aid because of it's simplicity. I thought it'd be easy because the center white line is "carved out" a little. I thought it would act like a track. I think it has to, to some extent, which makes it a little frustrating when I hit one of the bearings. I have a very difficult time seeing the aim line - one of the reasons I use the putter pictured. I usually line up the arrows on my ProV1x's from behind the ball and when I get over the putt, I swear it's not aimed where I want - I get back behind the ball, yep, it's right - get back over the ball, nope it's not. Even with my eyes over the ball evidenced by equal space between the ball and the lines on the putting-tutor + the long white line track, I am still surprised to see the ball end up where it comes to rest when I make it cleanly past the ball bearings. I got down to ground level and aimed the pelz line to my coffee mug, get up over the putt, and it doesn't look right. So, I think this will go a long way to help me re-train my eye if I use it enough. I never hit the left (inside) bearing. I hit the outside right bearing. I learned that I was decelerating. As soon as i started accelerating into impact, I was making it cleanly past the bearings with consistency. It took me a while to realize it as I tried different ball placements and grips. It was nice to see I could use my favored lead hand low grip, accelerate and hit a solid, square putt. Can't wait to take it to the putting green once the weather clears up. 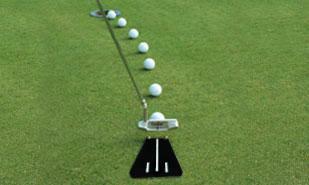 But the Tutor is absolutely one of the best putting aids ever made. Best training aide I've used in a long time. This really is a good training aid. I am surprised there is not a good knock off version. I think I paid about $30 bucks for this used a few years ago. absolutely great. I suggest not aiming at a hole but trying to hit it specific distances and making it thru the two metal balls. Then on the real greens all you are thinking about is line and distance. not the hole and you will see improvement . at least I did.